Northumberland Ferries - View timetables, Compare and book ferry tickets at directferries.ie. 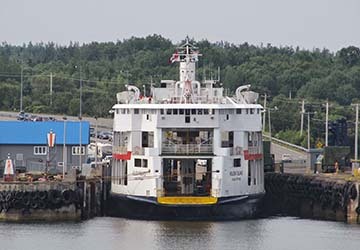 Northumberland Ferries Ltd sails across the namesake strait in eastern Canada, offering routes between Wood Islands on Prince Edward Island and the small rural settlement of Caribou in Nova Scotia. 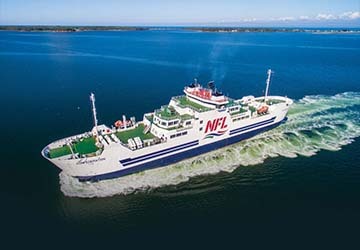 Originally founded by the Canadian government in 1941, Northumberland Ferries Ltd, or NFL, is now the owner of two subsidiaries including Bay Ferries Ltd.
NFL operates two large passenger vessels named MV Confederation and MV Holiday Island which cross the Northumberland Strait in just seventy five minutes, carrying just under five hundred thousand passengers annually. MV Confederation spans over a hundred and ten metres in length, with an impressive cruising speed of eighteen knots and a capacity for six hundred passengers, while MV Holiday Island holds a hundred and fifty vehicles and just under five hundred foot passengers. Both vessels feature on-board cafes, restaurants and gift shops, too. They’ve also been designed with superb viewing decks where you’re likely to spot some of the local wildlife including porpoises and seals. Direct Ferries provides a ferry timetable and price comparison, based on your search criteria, allowing you to compare Northumberland Ferries products with multiple ferry company timetables and fares in one search. Compare Northumberland Ferries timetables and prices now with all alternative ferry operators before booking your ferry ticket to ensure you get the best option for your ferry trip.